Miniature landscapes, fairy gardens, miniature railways and villages fascinate and amuse kids of all ages – the builders, as well as spectators. What is it about tiny railways with bridges, vehicle crossings, buildings and villages that enthralls us so? All the scenery you see on a real life cross country journey becomes magical when translated into miniature. 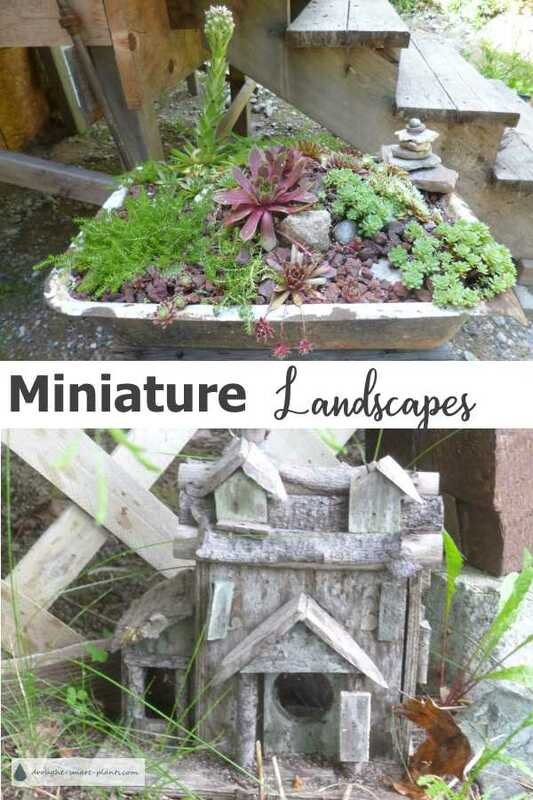 The newest and most intriguing miniature landscape fad is fairy gardens - charming and diminutive little houses, gardens and forests for the tiny folk among us. Building miniature gardens can become an obsession, and finding the tiny plants to fill the minuscule scenes an equally absorbing passion. I’ve listed a few of the most popular for planting in your miniature scene here, based on their small size and ease of establishment and care. Sedum dasyphyllum – tiny blue bead-like leaves which will root to form a very low growing mat and white flowers in summer which can be removed if they detract from the scale of the scene. Sedum album ‘Faro Form’ – tiny bright green succulent foliage. Very pretty, small scale ground cover. Sedum reflexum ‘Blue Spruce’ – larger than the above two types, but looks so much like its name it resembles a tiny forest. See five favorite Stonecrop for miniature gardens for more. Thymus ‘Elfin’ – tiny overlapping foliage, followed by bright pink blooms. Resembles a tiny shrub or groundcover. Thymus citriodorus – use these for hedging, or pruned to a single stem to make a shrub or tree, depending on your scale. Thymus argentea – similar to citriodorus, but silver and green variegated foliage instead of gold. Great for making miniature shrubs or hedging. Sedum album – larger version of Faro form, above. Sedum populifolium - prune this to form a little tree - outstanding as a bonsai or with several to make a tiny forest. Thymus ‘Bressingham Pink’ – larger scale thyme with bright pink flowers. Looks great cascading over a wall or embankment. Thymus albus – white blooming form, very pretty light green foliage. Teucrium chamadrys – twiggy, many stemmed shrublet. Picea albertiana conica - Dwarf Alberta spruce – evergreen spruce, grows in a conical shape like a little Christmas tree. Great for a forest scene. Very slow growing, and easy to prune. Other dwarf spruce – Ohlendorfii – the birds nest spruce, dark green tiny needles. Prune to make a craggy tree on a cliff or mountain scene. Taxus ‘Hicksii’ – dark green needle evergreen. Has red berries eventually. Amenable to pruning, which makes new growth break from even quite woody older growth. Pinus mugo – can be easily pruned to make a tree form, or several stems to make a grove. Paxistima canbyi – small scale shrublet, great for mixed forest or stands of trees. Easy to prune to shape. Look for those plants that will respond well to pruning so you can keep them small and in scale. Many other alpine and rockery plants will be suitable. Avoid any plants with rampant aggressive growth, or that become invasive such as Lamium species, or Gallium odoratum. These tend to spread with underground stolons, which are impossible to remove without taking apart your scene. Use thyme or some of the smaller groundcovers such as Veronica lewinensis instead. Keeping the scale of the plantings very small will give your scene much more dimension and depth. How far apart to plant is important too, to prevent more assertive plants to take over. Over planting, or planting too closely will make your scene look like a jungle, so leave some areas bare with just small mulches such as turkey grit, or sand. Avoid over fertilizing so the plants don’t out grow their spaces. I recommend worm castings or compost tea if necessary for health of the plants, but only about half the strength will be needed. Pruning and pinching of the top growth will enable the plant to put out more branches, making it fuller, as well as encouraging the leaves to be smaller. Fruit or berries will stay the same, but each successive growth spurt will be finer and with shorter internodes. Each time the plant puts out 4 to 6 cm of growth, use your fingers to pinch it back by half, or cut it with small scissors. Techniques similar to those used for bonsai growing will keep the plant from getting bigger once it reaches the optimum size for your scene. Every year or two, in springtime, the plant must be dug up carefully, and all the roots trimmed back to encourage the growth of finer roots. This makes the plant, even though perfectly healthy, put out smaller amounts of top growth and the leaves will be smaller. Once you get bitten by the miniature landscaping bug, it’s hard to stop. Keeping your trains running, and building more houses and cottages for your village scenes and fairy gardens will give you hours of fun. I highly recommend this for keeping your inner child out of trouble!